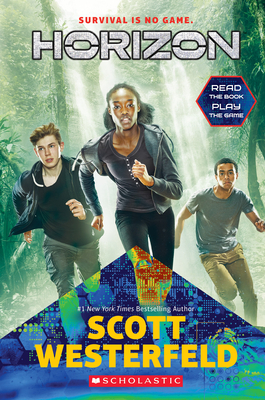 This harrowing tale of supernatural suspense kicks off a new series from the visionary mind of #1 New York Times bestselling author Scott Westerfeld. When a plane crash-lands in the arctic, eight young survivors step from the wreckage expecting to see nothing but ice and snow. Instead they find themselves lost in a strange jungle with no way to get home and little hope of rescue. Food is running out. Water is scarce. And the jungle is full of threats unlike anything the survivors have ever seen before -- from razor-beaked shredder birds to carnivorous vines and much, much worse. With danger at every turn, these eight kids must learn to work together to survive. But cliques and rivalries threaten to tear them apart. And not everyone will make it out of the jungle alive. BONUS! In the Horizon multiplatform experience, you're not just reading about the castaways, you're one of them. Join the race for survival in the FREE game, available on your browser and as an app. Scott Westerfeld is the #1 New York Times bestselling author of the Uglies series, which has been translated into 35 languages; the Leviathan series; Afterworlds; and many other books for young readers. He was born in Texas and alternates summers between Sydney, Australia and New York City.